After the first boil and fry, these can be kept in the freezer, ready to cook. 1. Slice the potatoes into matchsticks, just over 0.5cm wide. Rinse twice in water; put in a pan with the vinegar, salt and 1 litre cold water. Cover, bring to the boil and simmer for 4-6 minutes, until tender. Transfer to a wire rack set over kitchen paper with a slotted spoon; steam-dry for 10 minutes. 3. Return the oil to 200˚C; add the dripping, if using. 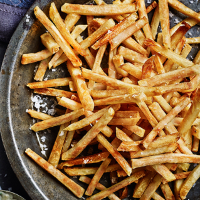 Fry the chips, in batches, for 2-2½ minutes, until crisp. Drain on a wire rack set over kitchen paper; sprinkle with salt.